So I got to take the bike on a 1/8 mile drag strip last weekend. Damn that was fun. It was $35 and you could do it as many times as you wanted. You'd make your run and then they'd hand you a printout at the end with all the stats and things. The highest speed I got was 103.6 and the fastest time was around 7.5 seconds. My average reaction time was like .4 seconds. I probably could've done better but my starts werent the greatest. I was having a hard time keeping the front end down. I have no idea if thats good or bad, but it was still pretty damn fun. 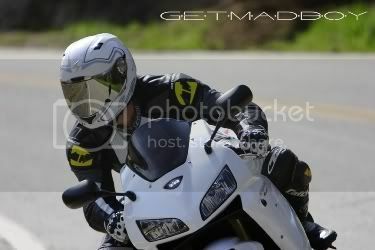 I was consistently beating the guys on the 600s and even a few on 675s and 750s, but Im guessing that was rider error. The 1000s beat me every time though. Those guys were hitting speeds of 115-120 in the 1/8 mile. I've been wanting to take mine to the track(1/4), but i'm still working on my launches. Brush yo teeth, brush yo teeth, brush yo got-damn teeth! Yeah, I wished it wouldve been a 1/4 mile strip but the 1/8 was still cool. Yup. The launches were hard. Lol... it made it a little odd too because unlike the cars, we'd have to put our feet down at the starting point and because of all the warm burned rubber there, our feet would stick to the pavement. Made it a little odd trying to quickly yank our feet up after launching. what kind of times did you run? I'm heading to the 1/4 mile track this weekend $40 all you can run. It's import day but they let a few bikes run. I wonder how many hot-head ricers will think their "suped up civic" will run close to my 07 600rr? haha. I'll post times/pictures/movies on Sunday. yea steal one of thoes kill switches off the lil 50cc quads they sell for the kids. wire it to your kill switch circut and atach it the inside of your ram air cover. bin their done this. we used to take my friends gsxr1100 to the strip all the time. he could run 9s. my fastest has been a 10.4......wow 40 bucks...down here its open track for 10 bucks.....8pm, to 12. Just got back from the track and am quite sunburned. But it was amazing. I'll post pics/vids in the next couple of days, but my fastest time was 11.17 with .043 reaction time and a trap speed of 125.5 I think.